How To Add Barcode and Redemption Code For Facebook Offers? Yesterday, we talked about a latest marketing and advertising feature introduced by Facebook called Facebook Offers. 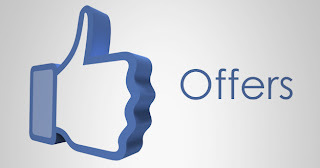 Facebook Offers let you promote your brand or products by giving out rewards to people who visit your website or your brand's physical location (office, store etc). These rewards can be anything, from an ebook to a small gift hamper to an entry into a lucky draw for a larger prize. It is the next step in Facebook marketing, and you can be one of the first ones to make use of this feature. We have already talked about what Facebook Offers. Today, we'll talk about the different types of offers, and how to add Redeem codes or Barcodes for people to be able to redeem your offers. There are three basic types of offers. For Online redemption, you will need a redeem code, which can't be used In Store Only. Similarly, barcode can only be used for In Store, and not online. Barcodes can be added when you create an In Store offer. They can be scanned easily, and then used to redeem your promotion or discount offers. To add a barcode, click on the barcode icon ( ) once you've entered a headline for your offer. Add a barcode here. You can enter a 12-digit Universal Product Code (UPC-A) barcode, or a 13-digit EAB barcode (click here for the Wikipedia article on barcodes). Make sure you format the number properly. Preview the barcode to see how it looks, and make sure it is readable. Most smartphones nowadays can scan barcodes through the use of an app if they have a camera with focus. People will be able to scan this barcodes right from their smartphones. Adding an online redemption code is easy, If you want people to enter a code on your website to receive a discount, then choose an Online option. Create your offer as discussed in the previous post. Enter the web address where people can get your offer, and add a redemption code (max 50 characters). Click Next, and you're done. When someone claims your offer, they get an email with detailed instructions on how to redeem the offer, along with barcodes and/or redemption codes. They will also get your terms and conditions with the expiration date included.